RRB Gorakhpur Group D Recruitment 2018-2019 Notification is the most searched Employment News in the Uttar Pradesh State. The reason for this very simple, these days most of the people are showing their willingness in the Government Sector. And that too for the Railway Sector. So, according to the information in the advertisement, there are total 3388 Track Maintainer Grade IV (Trackman), Gateman, Pointsman, Helpers in Electrical/ Engineering/ Mechanical/ Signal & Telecommunication departments, Porter & Other Vacancies. Starting from the 10th February 2018, many people applied for these positions. And there is still time for those people who didn’t apply till now. Therefore, please check the important details and follow to apply for the RRB Gorakhpur Group D Recruitment 2018-2019. Now, at the time of submitting the filled application form, all the people should also pay the application fee. The closing date to submit the application form is 31st March 2018. So, soon after checking the RRB Gorakhpur Group D Recruitment 2018-2019 Notification, you will get an idea about the payment of Application Fee. As per the information in the advertisement, those people who are from the General Category should Pay Rs.500 as the Application Fee. And the Officials of the Railway Recruitment Board Gorakhpur mentions that the Women/ SC/ST/ Ex-Service Man Categories have to Pay Rs.250, as the application Fee. Kindly remember that it would be ideal for the people, to check the advertisement, twice before paying the Application Fee. Because there are many sites out there that are providing misleading information. Keep this in mind and proceed. Now, much other important information about the RRB Gorakhpur Group D Recruitment 2018-2019 are available in the next sections of this post. All you have to do is check them to get an idea. We have inserted a table in this post. All the contenders who are eager to get all the details should check them all. 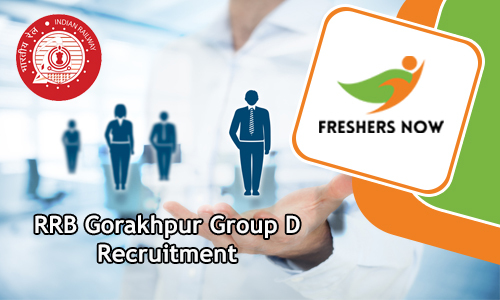 This will let you have a brief idea about the RRB Gorakhpur Group D Recruitment 2018-2019. Check them properly. Now, we know many people who are looking for the Government Jobs in Uttar Pradesh, cannot find an appropriate place, to find out about the details such as the starting date, closing date, official portal to submit the application form, mode of applying and many other details. Therefore, to give a helping hand to all such aspirants, here we are preparing this post. And it contains all the information that is given in the RRB Gorakhpur Group D Recruitment 2018-2019 Notification. Please follow next section of this post, for more information. Now, top of any requirements, all the people should know about the educational qualification. According to the data in the official RRB Gorakhpur Group D Recruitment 2018-2019 Notification, 10th class or ITI or its equivalent from NCVT or SCVT in India is the requirement of education. Please remember that having this as the educational qualification is quite important to have. And note that the officials of the RRB Gorakhpur will not consider your application form for the RRB Gorakhpur Group D Recruitment 2018-2019 if you are not having all the qualifications, even though if submit it before the closing date. Proceed to find out remaining information, only if you have had the above mentioned as the educational qualification. Go to the next part of this article. Now, following the educational qualification, all the people should also know about the correct age limit, at the time of applying for RRB Gorakhpur Group D Recruitment 2018-2019. As per the information in the Notification, the officials are accepting the applications with the Minimum age of 18 years. And the Maximum Age to apply for these 3388 Group D Vacancies is 31 Years. Having this Age limit along with the educational qualification is very important, keep this in mind, and proceed further. Do not waste your time by applying even though if you are not having all the qualifications correctly. This will leave you with the disappointment. Now, with all these requirements and eligibilities, all the people should submit their application form in the prescribed format. And this should be done within the closing date. After the last date, the officials of the Railway Recruitment Board Gorakhpur will analyze the applications for the next process of the Recruitment. Now, after applying for the RRB Gorakhpur Group D Recruitment 2018-2019, many people choose to ignore about knowing the Recruitment Rounds. And this results them in not preparing and performing well. Due to which they are losing the chances of getting placed. Now, the officials of the RRB Gorakhpur mentioned that they are going to conduct some selection rounds. And this is to choose the best applicants from all the enrollees. Therefore, all the contenders who will perform well in those Process will get a chance to placed in the organization. As per the information in the RRB Gorakhpur Group D Recruitment 2018-2019 Notification, contenders, will have to face Written Test (Computer Based Test), Physical Efficiency Test (PET), Document Verification, Personal interview. All the applicants will go to the next rounds, only if he or she performs well in the initial round. Only the merit and skill shown in these rounds will be considered. And the final decision on hiring an individual will be in the Organization. There won’t be any changes in it. So, keep this in mind and prepare well. On our site surely, you can find some preparation stuff. This will help you to practice well. Without the Application Fee, your application form is invalid. The age of the applicants must be between 18 years to 31 years. Selected contenders will get Rs.18,000. First, check the official portal of Railway Recruitment Board Gorakhpur at rrbgkp.gov.in. And then find the RRB Gorakhpur Group D Recruitment 2018-2019 Notification. So, thereafter, check the details given in the information. And if you are interested and eligible, download the application form. And then enter the details. And Finally, recheck and submit before the closing date. Like the information that is given on this page, about RRB Gorakhpur Group D Recruitment 2018-2019? then for more such latest updates and Notifications, check our site Freshers Now daily.